The sculpture consists of a cross-sectional slice originating from a poplar tree that had been standing since the beginning of the Gerrit Rietveld Academie and later Sandberg Institute. The tree was one of the last remaining from that time and cut down in order to make room for the new academy building in 2016. During the felling of the tree I was present and asked for a section of the tree trunk to be saved at the Rietveld Academie. With its annual rings it is a material embodiment of compressed time and growing expansion. 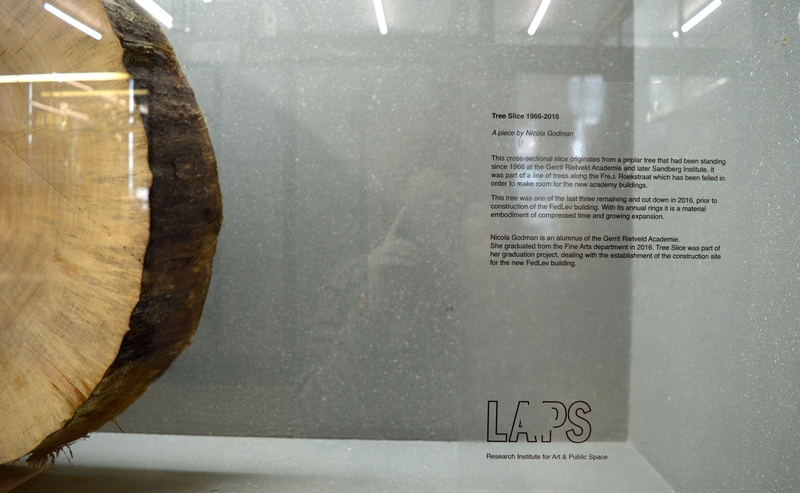 The sculpture is displayed in a cabinet belonging to office of LAPS - Research Institute Art & Public Space, in the main building of the Gerrit Rietveld Academie.